Javanese dance has a rich tradition dating back to the influence of Indian culture on the island as far back as the 7th century. During this time the poetic epics "Mahabharata" and "Ramayana" were created, and they served as the basis for dances, poems, and art for centuries to come. 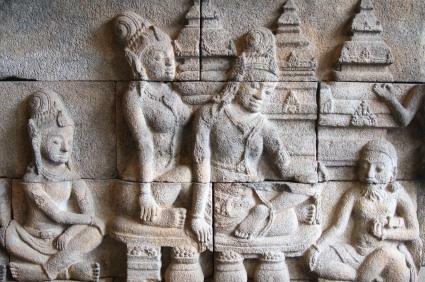 While there were other influences in the following millennium such as Islam, indigenous rulers, and the arrival of Dutch colonialists from the west, it is still the stories of the heroes and villains of the two tales that are danced and sung in Javanese dance today. Dance comes from many different sources in Javanese culture, much like its neighbor, Bali. It is seen as part of religious ceremonies, celebratory festivals, and many other venues. Some dances developed in the royal courts of Java; other Javanese dances were created by professional dancers over the years and developed into their own styles. Dance is taught not only in specialized studios as in the west but as a part of everyday village life, in the schools and also in arts-based magnet schools throughout the country. Part of why it is so pervasive throughout Javanese culture is because of its purpose beyond entertainment. Javanese dance serves as a means of moral education for the culture. All of the heroes of the Mahabharata and Ramayana have specific attributes and traits that let almost anyone identify with some character, and develop the positive aspects of that hero (or villain, in some cases). Unlike many western mythologies, the characters in Javanese dance have many facets to them, and there are parts of each that can be admired. While they are named after individual jobs, these are much more indicative of a style and feeling of the movements, not of the characters themselves. They are also said to mirror the four levels of existence common to Hinduism. Another division is the class of character that is considered alus or refined and their complement, the gagah characters who are more aggressive and coarse in their manners. There is not a judgment made on either of these - they are simply aspects of the people portrayed in the stories. Beksan putri - putri is the word for female in Javanese, and these dances include courtly dances designed for exclusive royal events, with very precise movements and distinct staging with many layers of meaning. Beksan putra - The other side of this is the dances for men, which serve a dual purpose of being a military form of close-order drill and also letting them show off their martial skills. Often dancers will learn these dances to familiarize themselves with the movement vocabulary necessary for some of the more narrative dances. Beksan wayang - this is the category which has the narrative dances from the epic poems, and usually the dances are named after the characters in them, usually an alus-style hero and a gagah- style villain. All of the dances are accompanied by a gamelan orchestra, and certain segments of the dances and the songs have become so familiar and popular with the audiences that they will sometimes attend performances just long enough to see that part, and then leave! Some of the favorite themes include movement as the protagonist is thinking about their love interest, or preparing to do battle with movements of dressing and arming themselves. These dances are narrated by the dhalang, a singer/storyteller accompanying the gamelan orchestra. One exception is called the "wayang wong series of dances, which are very closely associated with the wayang kulit or shadow-puppet theatre. The dancers in wayang wong'' narrate their own stories, all related to the mythology of the Mahabharata. Javanese dance has inspired many western choreographers including Broadway and film director Julie Taymor. The entire art form offers a depth of meaning and aesthetic form to anyone who chooses to study it.